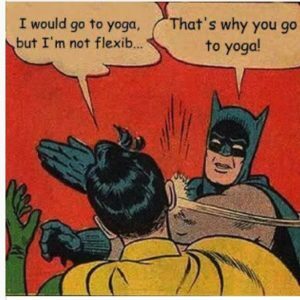 It is often assumed that to be a yogi you need to be bendy and size 6. If I had a protein bliss ball for every time someone said to me, “I can’t do yoga, I’m not flexible…” I’d be pretty fat! The definition of yoga is yoke or union. It is the bringing together of the breath, body and mind. That’s it. It doesn’t necessarily mean bending yourself into a pretzel or taking a selfie on the edge of a cliff wearing your bathing suit. It can do, but only if you’re noticing how your body feels at the particular moment, how the breath is. Is the breath moving freely but focused and is your mind connected and your body at ease. You can do yoga while you’re washing the dishes. Next time you’re standing at the sink. Close your eyes for a moment and feel the warm water and the suds. Feel the sensation as you let your hands dip below the surface. Notice your breath, the expansion of your chest and the contraction as you draw the belly back to the spine to help press the breath out. Take a few deep, slow breaths. take your focus out to the sounds around, birds, cars, laughter? Be in the moment. Simple.